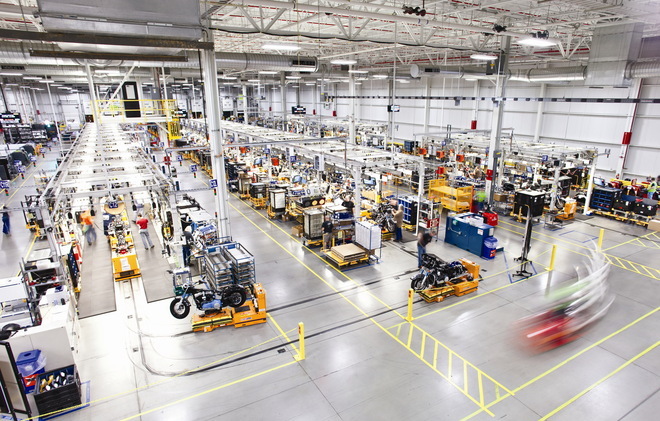 Harley-Davidson's new factory in York, Pa.
A new Harley-Davidson motorcycle rolls off the assembly line in York, PA.
You might recall that one of the first moving assembly lines was at Ford Motor Company in 1913. Until this time automobiles were built one at a time and were quite expensive. With the Model T, they began experimenting with different production techniques and the conveyor belt system was born. At its peak a finish Model T came off the assembly line every 10 seconds. Workers could not stop the line even if parts were wrong. Workers were not allowed to think on the job. They were allowed to only do their assigned task and do them ever quicker. They required almost no skill to perform and were highly repetitive. Many workers were unfulfilled and became bored and dissatisfied with their jobs. As a result, absenteeism rose and employee turnover became high. Fast forward 100+ years and everything has changed, right?. The “New Factory York” is Harley-Davidson’s largest motorcycle factory. Once there were 41 buildings on the huge 232 acre plot, but most have been demolished along with 2300 jobs. The entire manufacturing facility is now housed in one building. It’s a model of efficiency which H-D plans to “copy-exact” in Menomonee Falls and Tomahawk. The process is centered on advanced manufacturing techniques that are used at Toyota and Caterpillar that are well known for their quality and efficiencies. The Milwaukee changes are a com’in… because effective this month adjusted labor contracts went into effect giving the company more flexibility with the workforce. Similar to the York plant there can be the use of seasonal employees who are not entitled to medical or retirement benefits and receive less pay for the same work done by regular employees. While still unionized they are paid about $16.80 to $26 per hour versus $30.50 to $38 per hour for regular employees. But, just like in 1913 not all the workers seem to be infatuated with the changes. There is a great article written by Rick Barrett at the Journal Sentinel which captures the mixed opinions and whether the transformation has resulted in a better workplace. We all know that change is messy, but some of the comments had me wondering if some in the workforce would prefer a return to the Model T era.